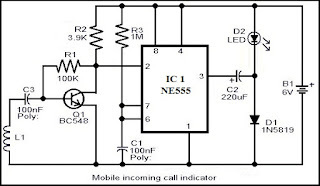 This circuit can be used to escape from the nuisance of mobile phone rings when you are at home. 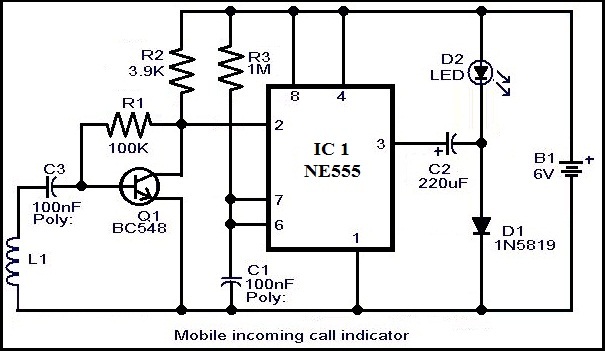 This circuit will give a visual indication if placed near a mobile phone even if the ringer is deactivated.When a call is coming to the mobile phone, the transmitter inside it becomes activated. The frequency of the transmitter is around 900MHz.The coil L1 picks up these oscillations by induction and feds it to the base of Q1. This makes the transistor Q1 activated. Since the Collector of Q1 is connected to the pin 2 of IC1 (NE555) , the IC1 is triggered to make the LED connected at its output pin (pin 3) to blink. The blinking of the LED is the indication of incoming call. The coil L1 can be made by making 150 turns of 36 SWG enameled copper wire on a 5mm diameter plastic former.Or you can purchase a 10 uH coil from shop if available. The circuit can be powered from a 6V battery. nbsp; C1 & C3 are to be polyester capacitors. The electrolytic capacitor C2 must be rated 10V.